When your dry hands and fingers begin to hinder your day to day activities, then it's high time to get help! Dry hands can appear on the very young to the elderly. 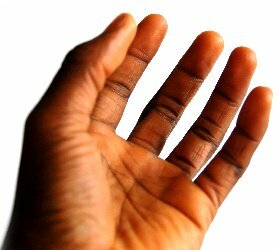 Symptoms may be the result of eczema or psoriasis but the bulk of the dry skin with cracked and peeling fingers are job related. Yes, they really are! Exposed to the elements, regularly submerged in water and often in contact with harsh soaps and chemicals, our hands and nails are a constant, visual reminder of the active lives we lead. 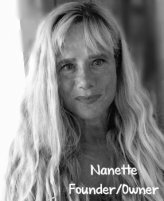 Brittle nails, frayed cuticles and dry hands not only make life difficult, but also make hands look older than they are. 1) Constant hand washing with harsh soaps as in the medical or child care profession (and certainly not limited to this). 3) Fibrous particles that get trapped in the pores and skin layers causing a reaction. 4) Constant exposure to extreme heat or cold. Certainly this list is not exhaustive. There are many more factors that can contribute to cracked, dry hands. Some things are hard to alter but start by reading labels on products and know what chemicals to avoid and which products cause your skin to react. You can avoid commercially produced soaps that act harshly to your skin and wash with only with a "non-soap" cleanser that is pure and gentle. It should be hypo-allergenic and contain only herbal ingredients that are organically grown. Many people ask, "What type of hand cream or hand lotion should I use for dry hands?" You need a skin cream that is highly suitable for infants, children and adults with sensitive skin problems as well as all skin types. 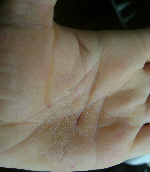 One of the primary ingredients should be urea , which is a “humectant” and actually binds water 7 layers deep below the surface of the epidermis, right down to the stratus corneum, which is the skin building layer allowing your sensitive skin to repair from “the bottom up” greatly benefiting dry hands. 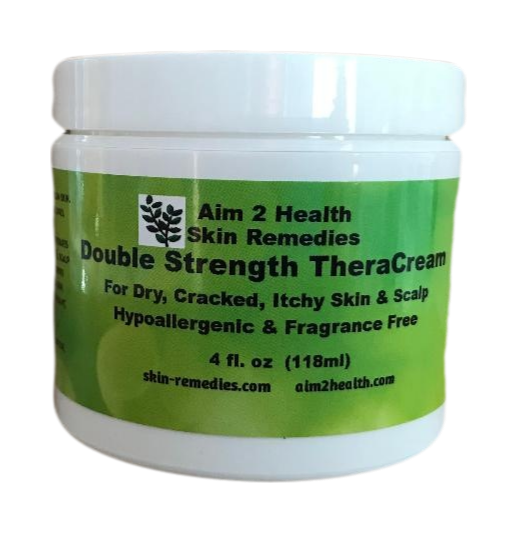 Other important ingredients include shea butter blended in a mix of herbal and botanical nutrients to add much needed nutrients and add a layer of "protection" against daily exposure. 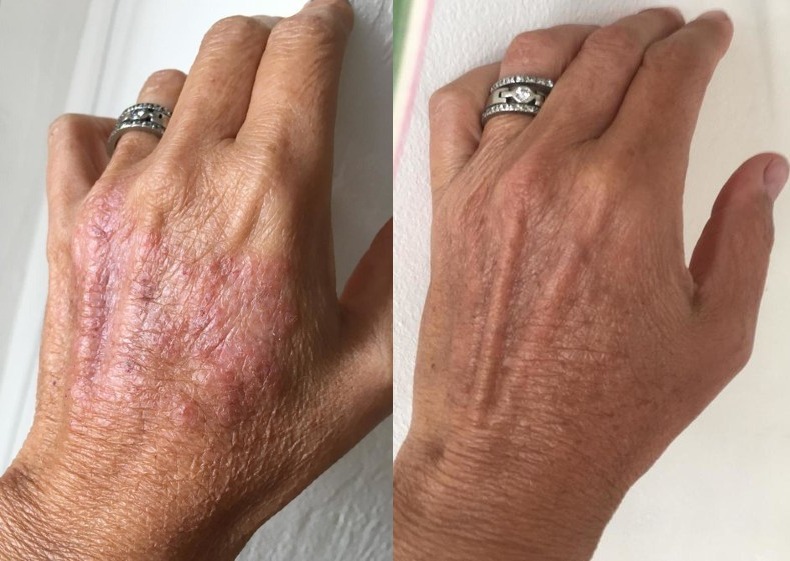 You see, only natural and organic products are designed to truly repair problem your dry hands and bring relief to parched, itchy, red and cracked hands and fingers. Remember, the skin responds to natural dry skin care products in the way it responds to good foods! To care for your dry hands and fingers, (whether work, eczema or psoriasis related) use only natural and therapeutic creams that absorb deeply and repair the skin fast. I wanted to share before and after pictures of the palm of my hand. I have been suffering from severe itching and deep cracks since the pregnancy of my second son for 6 years. 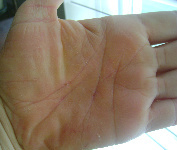 The first picture shows deep cracks in the center of the palm. The side of my hand which is difficult to see had water blisters. After 2-3 weeks my hand showed much improvement and the itching was much improved! Today, 6 weeks later the after picture shows tremendous improvement from the last six years! At 2-3 weeks, I also ordered your Green Powerhouse to assist my body internally. I am thrilled I found your products and I am no longer embarrassed about my hand. 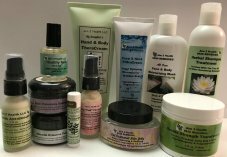 My sincere gratitude, Erika G.
Below you will find a link to the natural products I recommend that, in my professional opinion, work BEST for dry hands.